Florida is and has been an oil producing State. Currently over 160 wells produce oil in Florida, including in South Florida (Collier, Henry, Lee and Dade counties), as well as in the Panhandle (Escambia and Santa Rosa counties). The first Florida oil well dates back to 1943 introduced in the State by Humble Oil Company (present day Big Cypress Preserve) and drilled at about 11,600 ft (3,500m). Much of Florida’s oil history is centered in the Panhandle area, but significant oil exploration and production has also occurred in the State’s SW region, in Collier Country. The oil and gas sector has also actively sought oil off shore. In the image below you can see some of the sites where oil and gas have been found in the past or where there is large expectation that oil and gas could or would be present. Any fracking future activity would likely start exploration here and then move on to other sites across the State. The State has about two dozen or so oil fields (in Jay), mostly located in the western panhandle, and in Southwest Florida (in or near Collier County). 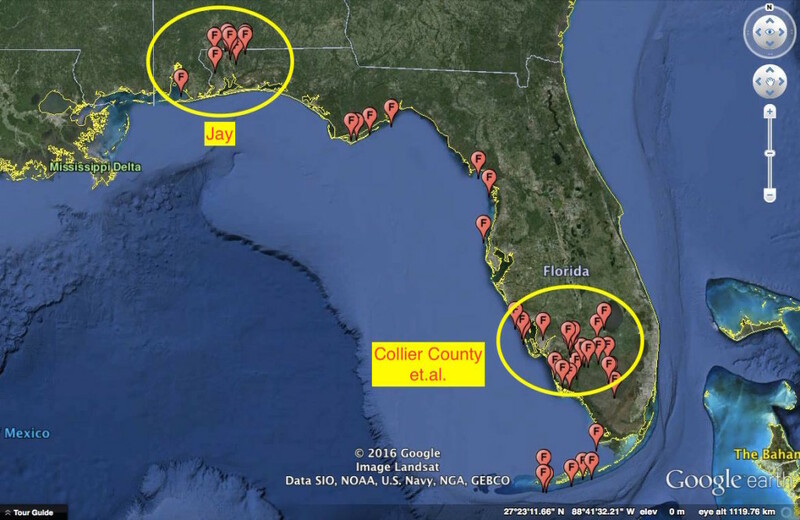 Two thirds of the oil produced in Florida comes from the Jay fields in Northwestern Florida. Most oil production in the State occurred between 1970 and 1990. Oil refining reached its maximum output of 45 million barrels in 1978, and dropped drastically to less than 2 million barrels annually. 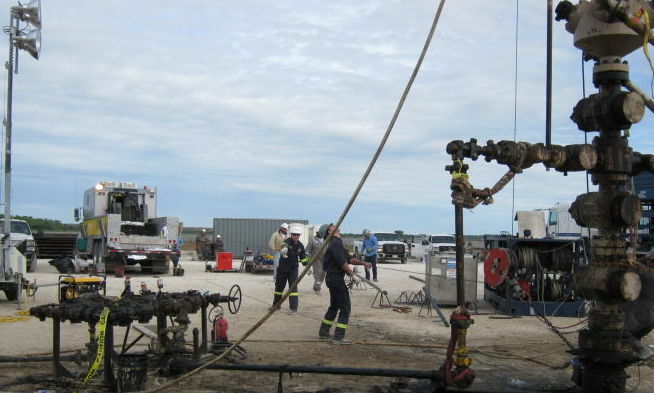 In late 2012, a Texan company called Hughes illegally utilized oil extraction permits to test hydraulic fracturing procedures (see image above) in panther territory near the Florida Everglades. Hughes injected acid into the underground to fracture the limestone, in a procedure referred to as “acid stimulation.” Hughes then injected a mix of chemicals and sand to the procedure, effectively carrying out “fracking”, which was not authorized in the company’s permit. Hughes was only discovered in this activity due to one of its contractors who sent notices out to local residents consulting on evacuation procedures in case of an explosion. The activity was immediately ordered to stop. For this, the company was fined 25,000 for the fault, and spurred on an environmental movement opposing fracking in the State. Since then, no known fracking activity has occurred in the State. If fracking were to come to Florida, residents living in counties where oil and gas extraction has occurred would be the first to likely get “fracked”. These would include: Escambia, Santa Rosa, Collier, Lee, Hendry, and Lee counties. But even if you happen to live near a county line to one of these counties, and there is an oil or gas deposit nearby in one of these neighboring counties, through the extension of horizontal drilling techniques which can explore for miles underground in horizontal directions and due to the typical impacts of fracking could easily affect your area, and that might include Miami-Dade, Broward, Glades, Okaloosa, and others. Those are the “most likely” and immediate scenarios for fracking explorations. 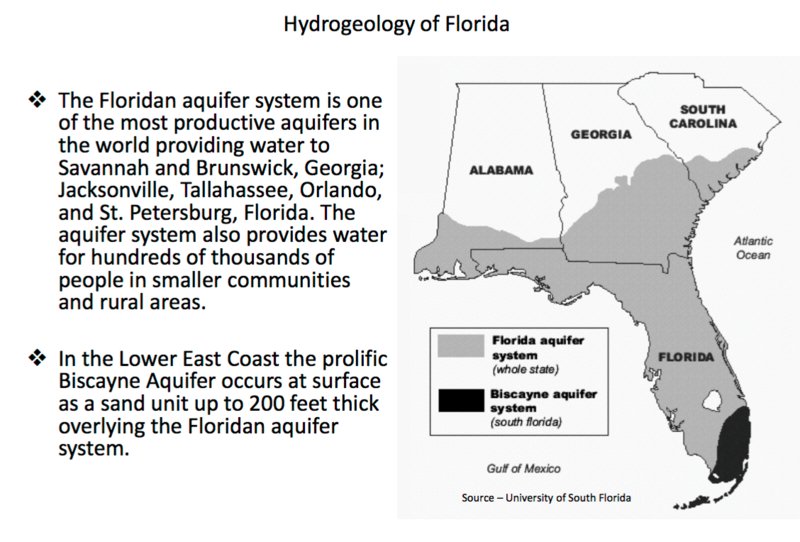 The fact is, however, that most of Florida has been explored for conventional gas and oil, and it is very well possible, that many areas that were deemed not suitable for conventional oil and gas production, could be found to be prospects for hydraulic fracturing and in that case, most any part of the the State of Florida could be a potential target for hydraulic fracturing.